0 products in your cart, total amount $0.00. 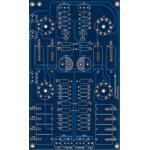 The circuit design is modified based on Audio Research preamplifier and the design values are optimized. It supports both single-end and balance input and output (RCA and XLR). Basically, the circuit is differential amplifier with two cascade stages. The input stage uses 12AU7 with moderate voltage gain, whereas the output stage uses 6DJ8 (6N11). The differential amplifier provides high PSRR and capability to noise rejection. 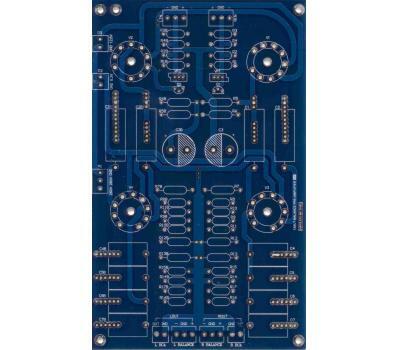 The signal paths of this PCB layout are designed in symmetry for both channels. Dedicated power rails, ground, and signal paths, altogether are taken into design considerations so that all are to minimize the parasitic, cross interference, and influence of RFI. · Two 12AU7 and two 6N11 (6DJ8) vacuum tubes. · Two single-ended and balanced inputs. 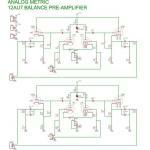 · Two single-ended and balanced outputs. · Symmetric layout design and signal paths with minimum parasitic. · Dedicated ground and power rails layout design. · Two large reservoir decoupling capacitors for power rails. · Power requirements: one 260V (80mA) DC, one 12.6V (0.5A) DC and one 6.3V (0.8A) DC. · PCB thickness: 2.4mm, double layer, 2oz copper. © 2000-2019 Analog Metric - DIY Audio Kit Developer Copyright, All Rights Reserved.